vickichristine: enough. no on prop 8.
enough. no on prop 8.
i find myself in constant search of enough. and in the blogosphere of blogs, enough means reason enough to write. to share my thoughts with you. i'd been considering prop 8 and my detestation towards it. but i thought that those (if any) who read this blog would probably share my disdain and so onto the next possibility i moved. but now, just now, on my way home from work, a block from my house, i saw 3 people (not 8) standing on the corner with signs that read: Honk if you love Prop 8! Prop 8 doesn't take away any rights! i have so many words i don't even know where to begin. can you picture them? what do they look like? are they angry? are they yelling at cars? are they wearing floor length frocks and holding up big wooden crosses? they look like me. they look like you. they are smiling and waving vigorously. they are trying to make friends. i look at them, make eye contact with them and give them my best sad face and a big ol' thumbs down. they laugh and wave back at me. i shake my head in disgust. they tell their comrades to pay attention to me. now, i am the focus of all 3 (not 8) demonstrators. with my hand, i offer the sign of peace and drive past them. 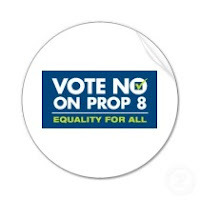 and so, i was compelled to write here, to blog, about how prop 8 is deceptive and evil. about how it's supporters can wear happy faces and display sunshine colored signs. about how they are promoting segregation and fear. about how people waste so much time worrying about what others are doing. i'm still shaking with anger, with sadness, with shock. i'm shaking enough to write. How is it that the most religious people are the ones that exclude others? I just don't get it. Let's keep fighting for rights for EVERYONE! I love you, my Vicki. Let's have lots of kids and have them change the world.